The 19th-century popularised the idea of the “nation state”. The 21st could be the century of the “civilisation state”. A civilisation state is a country that claims to represent not just a historic territory or a particular language or ethnic-group, but a distinctive civilisation. It is an idea that is gaining ground in states as diverse as China, India, Russia, Turkey and, even, the US. The notion of the civilisation state has distinctly illiberal implications. It implies that attempts to define universal human rights or common democratic standards are wrong-headed, since each civilisation needs political institutions that reflect its own unique culture. The idea of a civilisation state is also exclusive. Minority groups and migrants may never fit in because they are not part of the core civilisation. One reason that the idea of the civilisation state is likely to gain wider currency is the rise of China. In speeches to foreign audiences, President Xi Jinping likes to stress the unique history and civilisation of China. This idea has been promoted by pro-government intellectuals, such as Zhang Weiwei of Fudan university. In an influential book, The China Wave: Rise of a Civilisational State, Mr Zhang argues that modern China has succeeded because it has turned its back on western political ideas — and instead pursued a model rooted in its own Confucian culture and exam-based meritocratic traditions. Mr Zhang was adapting an idea first elaborated by Martin Jacques, a western writer, in a bestselling book, When China Rules The World. “China’s history of being a nation state”, Mr Jacques argues, “dates back only 120-150 years: its civilisational history dates back thousands of years.” He believes that the distinct character of Chinese civilisation leads to social and political norms that are very different from those prevalent in the west, including “the idea that the state should be based on familial relations [and] a very different view of the relationship between the individual and society, with the latter regarded as much more important”. Like China, India has a population of well over 1bn people. Theorists for the ruling Bharatiya Janata party are attracted to the idea that India is more than a mere nation — and is, instead, a distinct civilisation. For the BJP, the single most distinctive feature of Indian civilisation is the Hindu religion — a notion that implicitly relegates Indian Muslims to a second tier of citizenship. In a global system moulded by the west, it is unsurprising that some intellectuals in countries such as China, India or Russia should want to stress the distinctiveness of their own civilisations. What is more surprising is that rightwing thinkers in the US are also retreating from the idea of “universal values” — in favour of emphasising the unique and allegedly endangered nature of western civilisation. Steve Bannon, who was briefly chief strategist in the Trump White House, has argued repeatedly that mass migration and the decline of traditional Christian values are undermining western civilisation. In an attempt to arrest this decline, Mr Bannon is helping to establish an “academy for the Judeo-Christian west” in Italy, designed to train a new generation of leaders. The Bannonite argument that mass migration is undermining traditional American values is central to Donald Trump’s ideology. In a speech in Warsaw in 2017, the US president declared that the “fundamental question of our time is whether the west has the will to survive”, before reassuring his audience that “our civilisation will triumph”. But, oddly enough, Mr Trump’s embrace of a “civilisational” view of the world may actually be a symptom of the decline of the west. His predecessors confidently proclaimed that American values were “universal” and were destined to triumph across the world. And it was the global power of western ideas that has made the nation-state the international norm for political organisation. The rise of Asian powers such as China and India may create new models: step forward, the “civilisation state”. Li Keqiang, China’s premier, has a few ideas for 2019: keep overall debt growth in check, cut taxes, accelerate government bond issuance, and boost lending to small businesses. If that sounds like a lot to ask—and contradictory—it is. Some of these goals will fall by the wayside. Getting banks to lend more to small businesses without overall credit growth accelerating will be near impossible. And significantly higher government debt sales will require more banking system liquidity to keep rates from rising and further damaging growth. That means more monetary easing: probably not a 2015-like flood, but definitely a rising tide. Beijing rightly recognizes that its two previous rounds of stimulus in the past decade, funded largely off the government’s books through state bank loans to state-owned enterprises, created a lot of bad debt for the buck. This time, the jolt is coming more from Beijing’s balance sheet: The government’s annual work report, delivered by Mr. Li on Tuesday, highlighted business tax and fee cuts totaling nearly 2 trillion yuan ($298 billion) for 2019 among other measures designed to keep Chinese growth between 6% and 6.5% this year. 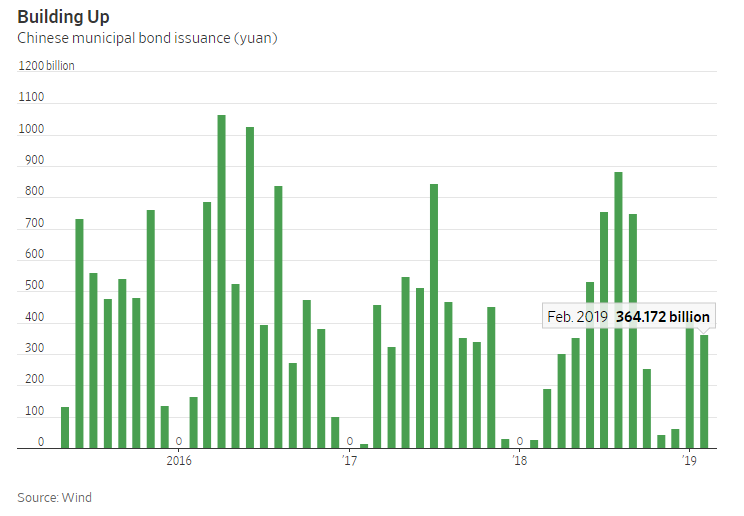 It also gave local governments a 2.15 trillion yuan quota to issue municipal “special purpose bonds” that are often used for infrastructure funding—a nearly 60% higher quota than for 2018. 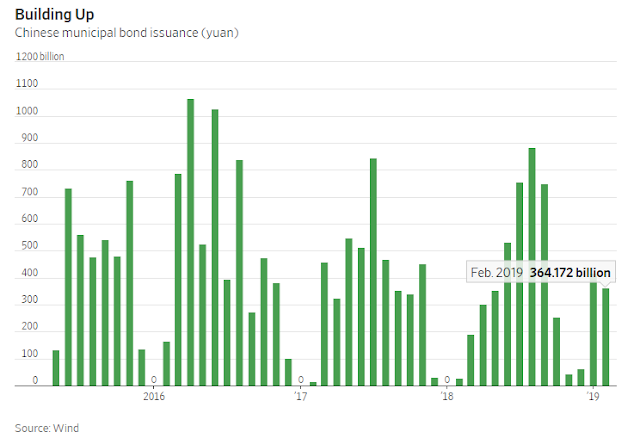 All that new official debt will need buyers—and that means higher banking-sector liquidity, since banks own nearly the entire Chinese municipal bond market. Mr. Li did call for lower reserve-requirement ratios at smaller banks to boost lending, and using “interest rate, quantitative and price tools” as appropriate. He also said, however, that total credit outstanding should grow at the same rate as nominal gross domestic product. Since nominal GDP growth was just 9.7% last year and seems certain to slow further in 2019, that would mean total credit growth—about 10% currently—would also need to fall further. It seems unlikely, to say the least, that Chinese policy makers will be able to impose even tighter monetary policy, while simultaneously flooding the bond market with new government issues—and somehow magically arresting the growth slowdown at the same time. In short, Beijing is still holding on to contradictory goals: boosting growth and formal government debt issuance while keeping overall indebtedness in check. The result is likely to be a relatively weak stimulus by past standards—although still enough to boost overall leverage—and a weak recovery, at best, some time in the second half. As the United States alters its strategy, the others will follow suit. The Hanoi talks ended in deadlock. Both sides – represented by U.S. President Donald Trump and North Korean leader Kim Jong Un – showed their anger by refusing to shake hands. The media labeled the talks a failure. But I’ve been involved in a number of negotiations in my life, and I see this as a normal part of the process. At some point, all parties will take positions designed to test the other side’s hunger for a deal, and prudent negotiators know that showing hunger can be devastating. So, ending the negotiation, particularly with a show of anger, is routine. At the same time, mutual rejection can be genuine, and now each side is trying to figure out how serious the other is. Establishing that you are prepared to walk away from the table is important – but sometimes the deal falls apart as a result. War with North Korea is not a good option for the U.S. There’s the danger of artillery fire close to Seoul, the uncertainty of the location of North Korea’s nuclear weapons, and the U.S. aversion to the idea of getting bogged down in another war this century. North Korea, on the other hand, knows that one thing that would trigger a U.S. pre-emptive nuclear strike would be to develop weapons that can reach the U.S., and it wants to avoid such a strike at all costs. So, this failed negotiation leaves a reality in which war is not likely, giving both sides room for obstinacy. The other major players in the region must now calculate their courses. For China and Russia, there’s little downside to the United States’ attention being diverted to North Korea. The more the U.S. feels under pressure to attend to other issues, the less it can focus on China and Russia. But it’s not clear whether the Hanoi outcome helps or hurts these two. On the one hand, the U.S. and North Korea are furious at each other. On the other hand, if this results in a frozen conflict, the U.S. can spare attention for others. The logic is that China and Russia will push North Korea to more overt moves to draw Washington’s focus. But North Korea has created room to maneuver for itself, and a cold distance from the United States serves it well. For the U.S., the years since 9/11 have forcibly displayed the limits of its military power. The U.S. is very good at destroying enemy armies, but it is very bad at occupying enemy countries where the citizens’ morale has not been crushed (think Germany or Japan during World War II). In Iraq, for example, the U.S. expected Iraqis to welcome the Americans. Some did, some were indifferent and some resisted. The resistance was prepared to absorb substantial casualties; this was their country, and they had nowhere else to go. The U.S., quite reasonably, was not prepared for high casualties, as Iraq was not a fundamental, long-term, American interest. The local forces understood the social and physical terrain, while the U.S. had limited familiarity. The initial attacks were successful. The occupation was a mess. Thus, out of necessity, the U.S. has adopted a strategy that draws down its forces and that is extremely cautious about engagements where it cannot crush civilian morale through World War II-style bombing and blockade. Even if confident in its ability to break a conventional or nuclear force, the U.S. has no appetite for occupation. The strategy since World War II, built on the assumption that U.S. conventional forces can defeat any foe and pacify the country, is being abandoned. And in the case of the Hanoi talks, the U.S. is following a new strategy of diplomatic deadlock without recourse to the insertion of force. We understand therefore the North Korean, Chinese, Russian and U.S. positions. (South Korea, of course, wants a stable balance on the Korean Peninsula.) The country whose strategy is uncertain is Japan. The major question that has emerged from the Hanoi talks is what Japan will do now. Japan is the world’s third-largest economy. It has a stable and homogeneous population, a substantial military force and an enormous capacity to increase that force. The U.S. has decided to accept that North Korea is a nuclear state, so long as none of its nuclear weapons can reach the U.S. mainland. This completely destabilizes Japan’s strategy. Under that strategy, first imposed by the U.S. and happily embraced by Japan, the U.S. guarantees Japanese national security. The U.S., in exchange, has been able to use Japan as a base from which to project force across the Korean Peninsula, threaten China and block Russia’s Vladivostok fleet from accessing the Pacific Ocean. Japan, unencumbered by defense expenditures and any responsibility in American wars, could focus on the monumental task of its dramatic post-World War II recovery. Most important, the U.S. nuclear umbrella has guaranteed that any nation that might attack Japan with nuclear weapons would face retaliation from the United States. In reality, the United States’ willingness to launch a massive nuclear exchange if China or Russia hit a Japanese city was always uncertain. But since it was uncertain to potential aggressors too, it served its purpose, which was more psychological than military. The Hanoi talks subtly shift that guarantee. The new U.S. position is that it cannot accept a North Korean nuclear program that threatens the United States. Implicit in that position is that it can tolerate one that threatens Japan. The U.S. nuclear umbrella is notionally still there, but the United States’ reluctance to engage raises the question of whether North Korea will be deterred. So, the U.S. nuclear deterrent still guards Japan – but can the guardian be trusted? Japan lives in a rough neighborhood. The Russians hold islands to which the Japanese lay claim, and while it’s not a real threat now, the Russian future is always unknown. China is challenging Japan’s control of islands in the East China Sea and is threatening to potentially take control of the Western Pacific, which is currently in the hands of the United States. China has a long memory of Japanese occupation and atrocities committed during the Sino-Japanese War. The Korean Peninsula, too, has a long memory of Japanese occupation, exploitation and abuse. So apart from the current geopolitical reality, Japan lives in a region that resents it for historical reasons. In this context, the Japanese continue to struggle internally over defense policy. Japan’s current policy is to build a substantial force while minimizing its capabilities, saying it is only for national defense purposes. The alternative is for the world’s third-largest economy to normalize its international status by abandoning the constitutional prohibition on military force (already ignored for the most part) and create an armed force congruent with its economic might and strategic interests. The Japanese public is on the whole comfortable with its postwar strategy. But with the rise of China, North Korean nuclear weapons and a potentially aggressive Russia, it cannot remain so for long. As the U.S. puts pressure on its allies to carry their own burdens, the Japanese strategy is becoming increasingly untenable. It cannot undergo a serious shift until the public does, and that means there will be an internal political crisis over the matter. But public opinion is already shifting, and the Japanese will face their reality. Behind all this is an inevitable shift in U.S. foreign policy, visible in its stance on North Korea and elsewhere and rooted in the failure of U.S. warfare since World War II. The Korean War was a costly tie. Vietnam ended with Hanoi’s flag flying over Saigon. The wars in Iraq and Afghanistan failed to establish viable, pro-U.S. regimes. The only 20th century wars in which the U.S. fared well were those in which U.S. allies bore a massive part of the burden. These wars only ended well when there was no U.S. occupation or when the ruthless execution of the war shattered the morale of the enemy and permitted the U.S. to reshape the societies. And very few wars will be like that. That U.S. strategy had to shift was obvious to me a decade ago when I wrote “The Next Decade.” The shift has arrived, and that means nations, enemies and allies are repositioning themselves. In Asia, the Chinese and Russians will mostly hold their positions. North Korea will exploit the shift to the extent it can. But it is Japan that will have to undergo the most radical change. China’s authorities are committed to advancing the shift toward a market-driven economy, with a fully flexible exchange-rate regime. That means that, while it can credibly commit not to keep the value of the renminbi artificially low, it must reject US demands to keep the exchange rate stable against the dollar. BEIJING – The United States is reportedly pushing China to agree to keep the value of the renminbi stable, as part of a deal to end the trade war between the world’s two largest economies. It is a demand that China must think twice about before accepting. The renminbi was undoubtedly undervalued for many years, including through a peg to the US dollar that was established in 1998. A undervalued renminbi was an important contributing factor to the trade surplus that China has run consistently since 1993, when its per capita income stood at just $400. In other words, even when China was a very poor country, it was exporting capital to the rest of the world, especially the US. Though running a trade surplus benefits some sectors of the economy for some period of time, it is unclear that it benefits the economy as a whole in the long run. Still, two decades of maintaining a current-account surplus (which includes trade), together with a capital-account surplus (fueled by large inflows of foreign direct investment), enabled China to accumulate huge foreign-exchange reserves and a large stock of FDI. As a result, though China is one of the world’s largest creditors, it has run an investment-income deficit for more than a decade. But, over the last 15 years or so, China has been working to correct its trade imbalances. Since 2005, when the renminbi’s dollar peg was eliminated, it has appreciated steadily. By the end of 2013, its exchange against the dollar had strengthened by 35%. In the same year, China’s current-account surplus fell to just 2% of GDP, from its 2007 peak of 10.1%. Moreover, since 2014, when looser capital controls left China’s capital account more responsive to broader changes in the global economy, the country has started to run significant capital-account deficits from time to time. Sometimes, those deficits are large enough to put the entire balance of payments in deficit, despite the trade surplus. On August 11, 2015, China took a major step to boost exchange-rate flexibility: instead of setting a daily midpoint for the renminbi independently, the People’s Bank of China began basing the midpoint on the previous day’s closing prices. Initially, there was only slight downward pressure on the renminbi in the foreign exchange market. But the poorly timed move ended up fueling expectations of currency devaluation, spurring a surge in capital outflows that drove down the renminbi’s value further. 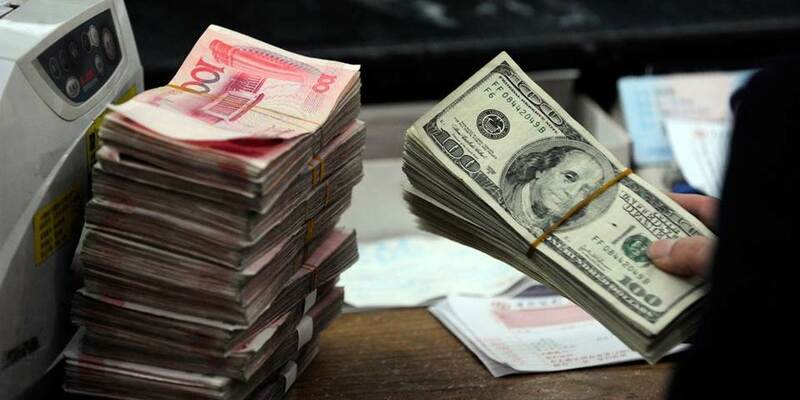 Some – including former US Federal Reserve Chair Janet Yellen, in a recent interview – have suggested that China devalued its currency that summer, in order to offset the effects of an appreciating dollar on the economy’s international competitiveness. The truth is that China, precisely because it feared that a depreciation would trigger even stronger expectations of further devaluation (ultimately endangering China’s financial stability), abruptly canceled the reform just days after it was initiated and began to intervene heavily in the foreign-exchange market to arrest the currency’s decline. When those interventions slowed in 2016, the renminbi began to depreciate again, spurring the PBOC to resume intervention. The PBOC spent some $1 trillion of China’s foreign-exchange reserves in less than two years to stem downward pressure on the exchange rate. In 2017, thanks to the tightening of capital controls and a fall in the dollar index, the renminbi exchange rate finally stabilized. There is no evidence that China has intervened to weaken the renminbi since – not even to offset the impact of higher US tariffs on Chinese exports – even as the exchange rate has fluctuated in response to fears about the trade war. The Chinese government knows that it is not in its best interests to manipulate its exchange rate. And, given China’s financial vulnerabilities, devaluation is particularly unappealing. So, while the Trump administration’s fear that China is manipulating its exchange rate to gain a trade advantage is not irrational, it is unfounded. Still, China cannot commit to keep the renminbi stable against the US dollar. China’s economic cycles are not synchronized with those of the US. The Federal Reserve may raise the federal funds rate at a time when the PBOC needs to cut its interest rate, which would spur capital outflows and drive down the renminbi’s value. It is a country’s sovereign right to decide its exchange-rate policy, and the US cannot expect to dictate China’s. So, even as it listens humbly to America’s complaints, China must retain full authority over its approach to the renminbi and be able to loosen monetary policy when economic conditions dictate, regardless of whether that causes the renminbi to depreciate. The US would disapprove, but what other choice would China have? It cannot forfeit its monetary independence, and it is not in China’s interest to block capital outflows to offset depreciation pressure. Nor can it continue to use its hard-earned – and limited – foreign-exchange reserves to prop up the renminbi’s value. How can China be sure the balance is enough to maintain exchange-rate stability indefinitely? Complicating matters further, the relationship between the renminbi’s value and the US dollar is not just bilateral. China has already committed to cut its trade surplus with the US – which comprises the majority of China’s overall trade surplus. If the US dollar rises in this context, China’s current account is likely to swing into deficit. Again, is China supposed to cut its imports from the rest of the world by whatever means necessary, or sacrifice its foreign-exchange reserves? This is not a purely bilateral issue – exchange rate misalignments often require international coordination to resolve. China’s authorities are committed to advancing the shift toward a market-driven economy, with a fully flexible exchange-rate regime. So, in the current trade negotiations with the US, it can credibly commit not to keep the value of the renminbi artificially low. But under no circumstances should it promise to keep the exchange rate stable against the dollar. Yu Yongding, a former president of the China Society of World Economics and director of the Institute of World Economics and Politics at the Chinese Academy of Social Sciences, served on the Monetary Policy Committee of the People’s Bank of China from 2004 to 2006. He has also served as a member of the Advisory Committee of National Planning of the Commission of National Development and Reform of the PRC.